Like the rest of America — okay, the world — country’s own Scotty McCreery is currently entranced by the 2012 Olympic Games. And it seems he’s got his eye on one gold medalist swimmer in particular. 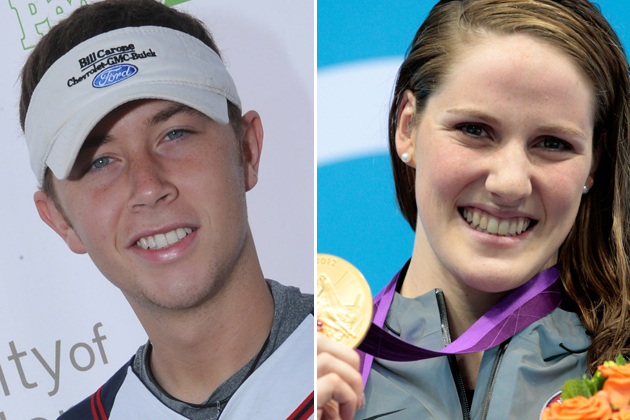 Using his Twitter account as a platform, McCreery has come out in full support of Olympian Missy Franklin. “I like how @franklinmissy wants to stay in high school even tho shes an olympian.. they were the best 4 years of my life for sure!” McCreery tweeted Monday afternoon (July 30). Franklin, a 17-year-old native of California, has brought in a few medals already in the 2012 Olympics. So far, she has won the bronze as part of a relay in the American Olympic swim team, and she also earned an individual gold medal in the 100-meter backstroke, breaking her own previously-held record in the process. While she’s unarguably one of the best swimmers in the world, it’s obvious that at heart, she’s still just a teenage girl, based on her response to McCreery’s message. “That means the world to me! Thank you so much!” she wrote back to ‘The Trouble With Girls’ singer. The teen swimming star is in everyone’s view right now — she even got a tweet from Justin Bieber — and is loving every minute, as she attempts to become the first female swimmer ever to swim in seven event finals in a single Olympics. Perhaps McCreery can relate to her in some way. He knows a little something about both winning, and staying in school. He shot to fame as the winner of the tenth season of ‘American Idol,’ and he is off to college in the fall, although he has promised to continue his music career. Tickets for Scotty McCreery's second concert at the NC State Fair will go on sale tomorrow August 1st at 10:00 am. At 8:00 pm EST tonight (July 31st) Scotty McCreery will be on the AskAnything with CMT Radio Live's host Cody Alan. Click on the link below & you can join the live chat!